A 3D printer uses filament to print plastic models. There are various types of printer filaments, the two most popular being ABS (Acrylonitrile Butadiene Styrene) and PLA (Polylactic Acid). Generally speaking, ABS requires more heat to melt, is a more durable filament, and dissolves in acetone. PLA melts at a lower temperature, is slightly more supple, and dissolves in chloroform. Our preferred filament type at Printable Scenery is PLA. ABS is a commonly used 3D printer filament, best for producing durable parts which can withstand higher temperatures. Since ABS dissolves when acetone is applied, the chemical can be used in small quantities to smooth edges and create a ‘glossy’ finish. 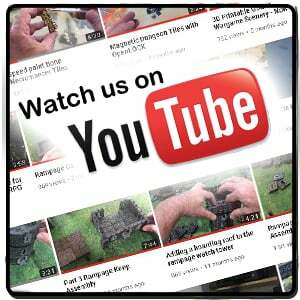 Generally this is done using acetone vapor, which you can read more about here. Learn more about printing with ABS here. You will be able to make a lot of prints with a 1kg roll of filament. For many 3D printers, PLA is recommended. PLA has a broad range of uses. It is less likely to warp and does not require additional heat to print. As a downside compared to ABS, PLA is generally more ‘brittle’. This only becomes a real issue when producing heavy-duty pieces, but using PLA with Printable Scenery products would present no issue. Similarly to ABS, chloroform dissolves PLA, so applying chloroform vapor can produce a smooth, ‘glossy’ effect. Learn more about printing with PLA here. 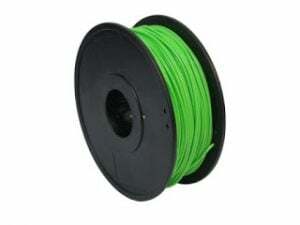 Both ABS and PLA filaments are available in 1.75mm and 3mm diameter, and a range of colours. We find that the best filament colour for printing the majority of our models is black, as this makes it fairly simple to prime for painting. However, we have achieved striking results with other colours, or even translucent filament for some of our models. 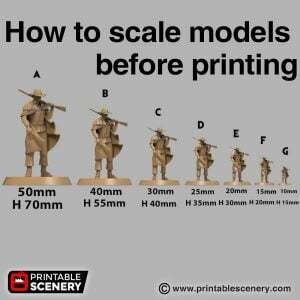 You should consult the specifications of your 3D printer to determine which diameter you need, as some printers may be incompatible with some sizes. If you would like to learn more about the different types of 3D printer filament, including others not discussed in this article, click here.